For Christmas each year, I might give as gifts those products that have impressed me through the year. My closest girlfriends received deodorant in their little gift bags a couple of Christmases ago. I have no idea what my lady friends did with that gift but I am still loving my deodorant. For years I had become concerned about the subtle concern that the contents of popular deodorants might be carcinogenic – the antiperspirant ingredient aluminum zirconium in particular was getting some bad press. The same way we wonder if the suspensions in which our vaccines float are causing autism, so too there is the uneasy feeling about a connection between deodorants and breast cancer. In an effort to move away from aluminum zirconium, I first tried Tom’s of Maine deodorant. I found that while the product had a wonderful scent, it was sticky and did nothing to prevent perspiration. Note that there are two components in your everyday “deodorants” – first is the antiperspirant ingredients (aluminum zirconium), then there are the scents, to make you smell good. So while the Tom’s products made me smell good, they weren’t keeping me dry. As this trial was five years or more ago, there might be improvement in the Tom’s product since then. Sometime along the way I became aware that there was a “crystal” – a stone that when rubbed underarm did the trick! At that time, the image in the catalogue in which I saw this product made it look like the kryptonite crystals in a Superman movie. It looked too far-fetched for me. Then one day, while shopping at Whole Foods, I saw a normal looking deodorant stick that was in fact the stone – not all jagged and Superman looking, but smooth and rounded – just like “normal” deodorant. So I bought it. The stone is only an anti body-odor product. It does not act as an antiperspirants (although I don’t find any difference in this regard) nor does it make you smell good. When using this product, you’ll have to rely on your perfume or cologne for that. What it does is neutralize, or perhaps eradicate, the odor causing bacteria. The CVS near my home now carries Naturally Fresh Deodorant Crystal – pictured here. It is Hypoallergenic, Paraben/PG free, and fragrance free. And best of all – it does not stain your clothes as regular deodorants do. To use it, you just run water over the smooth surface and then apply it under your arms. The one drawback is that it does leave marks on your countertop if it drips – so you need to dry any drops from the counter or lay a towel on the counter when applying your deodorant. Try it, and if you like it, pass it on to your mothers, daughters, girlfriends, and the men in your life (who in smaller percentages do get breast cancer). You’re welcome! I’m happy to share this info with my readers. Good for you for staying on top of your client’s Internet vibe! Great info! Thanks. 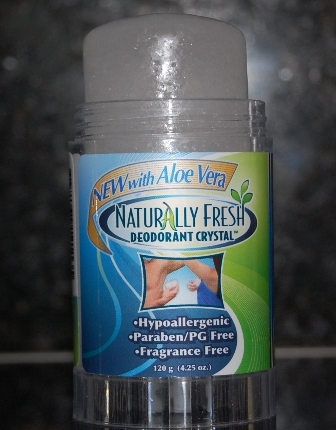 You can also buy Naturally Fresh Deodorant Crystal at Walmart, GNC, Vitamin Shoppe, Publix and Kroger. Also, check them out at http://www.naturallyfreshdeodorantcrystal.com/.